Metron MTS Automatic Transfer Switch provides operation of electric fire pump motors from a alternate source of power when the normal source fails. They may be used with any Metron electric fire pump controller - across-the-line, primary resistance, part winding, Wye-Delta, Auto Transformer or Solid State Reduced Voltage Types. These transfer switches are an integral part of the fire pump controller. They are factory assembled, shipped and installed as a part of the controller. 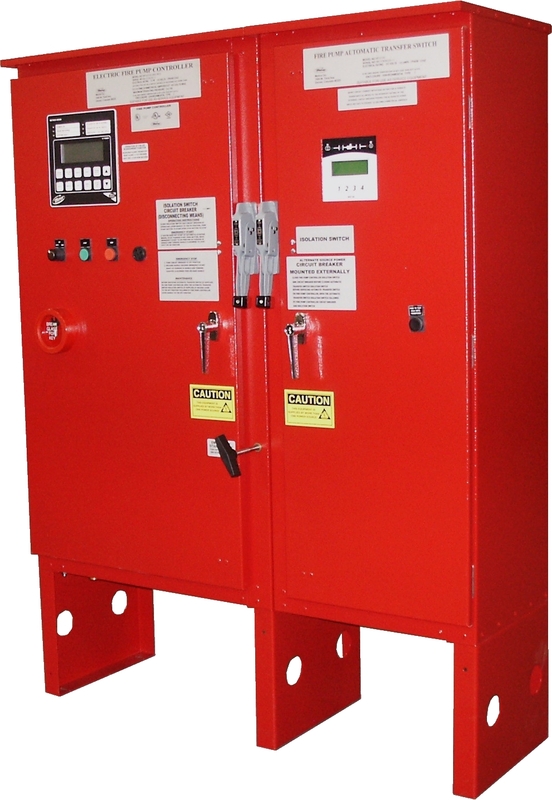 The combination fire pump controller/transfer switch is listed by Underwriters' Laboratories, Factory Mutual, and meets all the latest requirements of Section 7-8 of NFPA Standard for Installation of Centrifugal Fire Pumps. The MTS Automatic Transfer Switch is a mechanically held double throw switch with a fast acting drive mechanism. Operating coils are momentarily energized from the source to which the load is being transferred. The switch is interlocked electrically and mechanically to prevent both services from feeding the load at the same time. The transfer switch is capable of manual (non-electrical) operation. Undervoltage sensing devices are supplied which monitor each phase of normal service. When the voltage of any phase falls below the preset level the transfer switch automatically transfers to the alternate source. Voltage and frequency sensing devices are provided to monitor one phase of the alternate source and will inhibit transfer to the alternative source until adequate voltage and frequency are available. The transfer switch provides a special circuit that de-energizes the motor control circuit five (5) seconds prior to transfer in either direction to prevent high current transients due to an out-of-phase condition between the motor and the source to which it is being connected. A contact is provided to actuate the engine starting circuit when normal source fails. To prevent false starts, a time delay (factory set at ? to 3 seconds) is provided between normal source failure and actuation of the engine start contact. An isolation switch ahead of the alternate source input terminals of the transfer switch is provided. When the switch is opened, auxiliary contacts in the generator start circuit prevent starting if commanded to by the transfer switch. An additional auxiliary contact on the isolation switch is provided for remote annunciation of isolation switch position. An adjustable time delay (0-30 minutes) prevents restoration to normal service for a preset period of time to assure normal line stabilization. An auxiliary N.O. contact is provided for remote annunciation of transfer to emergency. This contact is operated by the transfer mechanism as a direct indication of switch position. LED's located on the controller OID indicate the transfer switch position, either normal or emergency. An additional LED is provided to indicate the Emergency Isolation Switch is in the OFF position. A test switch is also provided which simulates loss of normal power so that the transfer switch operation can be checked without interrupting normal service to the fire pump controller.